The InteliSwitch TS-400 series digital time switches automatically turn lights off after a preset time. 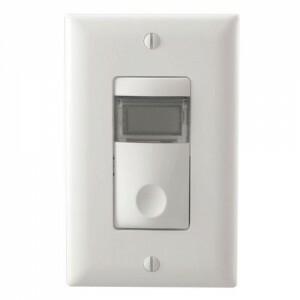 The simple pushbutton operation provides users with convenient time out lighting control without the nuisance of twist timers.The TS replaces an existing wall switch and operates between 100 and 300 volts and for low voltage applications. Pressing the TSs on/off button turns lights on, the lights will remain on for the duration of the time-out setting which is adjustable from 5 minutes to 12 hours. Lights can be turned off before the time-out setting expires by pressing the on/off button. Also, the unit can be reset at any time by holding down the on/off button for 2 seconds. This will bring the timer back to its original time out setting and restart the countdown.